With so many photo opportunities, the pretty flower-filled valleys sitting beside placid blue lakes, giant mountains and castles reflecting in the water, will remind you of the opening scene of The Sound of Music. On one day, you'll hop on St Wolfgang's antique cog railway to the summit of Schafberg for unrivalled Alpine views, whilst on another you can take time to reflect from the 400-year-old 'floating' castle in Gmunden, visit Mozart's museum in St Gilgen and Mondsee's frescoed high street, and check out Emperor Franz Josef's summer residence in Bad Ischl (he declared war on Serbia here, which led to WW1). Not forgetting, taking a trip on the Gisela - the last coal-fired paddle steamer on Lake Traunsee - and heading to the fairytale city and Baroque jewel that is Salzburg. 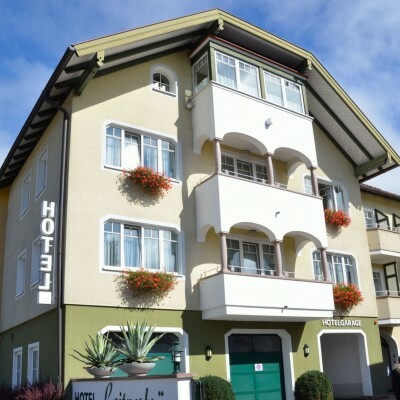 Arrive at your centrally located hotel in Mondsee, with time to explore before your evening meal. Today, you follow the shore of Mondsee before joining Attersee at the pretty lakeside town of Unterach and following the lakeside to Weissenbach. Follow a route on the eastern side of the lake through Steinbach and the scenic Weyregg, before passing through Schorfling where you can visit the Gustav Klimt museum. The backdrop of 1,000m peaks loom over the lake, and are mirrored in the water. As you head towards Gmunden and Traunsee, you will pass fields of wheat fringed by poppies and cornflowers. Today, take a trip on Gisela, the last coal-fired paddle steamer, once used by Archduke Franz Ferdinand. The cable car at the top of the Grunberg (944m) offers wonderful views at the summit, where you look down on Gmunden's esplanade and the romantic Seeschloss Ort, a 'floating' castle on the lake dating from the 17th-century. 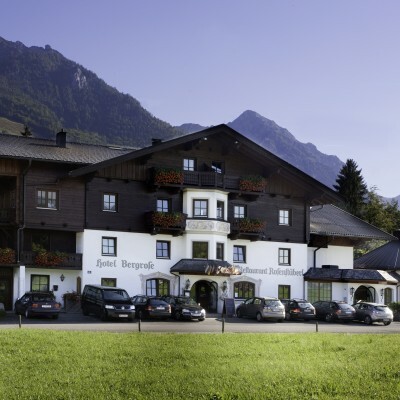 You're spoilt for choice for things to see and do in Bad Ischl: the imperial spa, the salt mines, the ice cave in Obertraun, thermal salt baths, the Katrin cable car, the Siriuskogl viewing platform, museums and villas. Perhaps take a horse-drawn carriage ride, people-watch on the riverside esplanade, or enjoy coffee and cake in the famous Zauner restaurant. 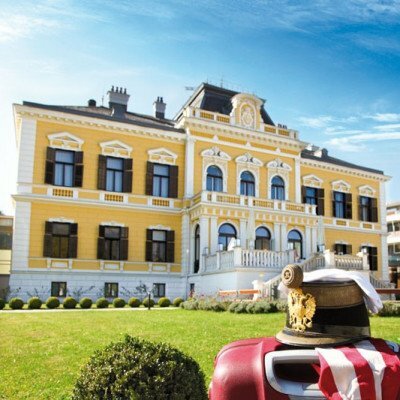 Explore the Kaiservilla, Emperor Franz Josef's former holiday home, before setting off along the banks of the River Ischl below the Leonsberg and Bleckwand peaks. Continue on to lakeside Strobl. You could take an optional detour to visit historic St Wolfgang. Spend the day in beautiful lakeside Strobl with its watersports, summer toboggan run and animal park. We have additional cycle routes here, or you can walk around the Burglstein on a lakeside path. It is possible to take the local bus (90 minutes) to visit the fairytale city of Salzburg, a Baroque jewel with a UNESCO-recognised historic centre. Stay close to Wolfgangsee's southern lakeshore, cycling through a tiny nature reserve into lovely St Gilgen. Take the cable car up Zwolferhorn for stunning 360-degree views, or visit the Mozart museum. Continue past idyllic Krottensee, an excellent refreshment stop, and continue down into Mondsee following along the lake with plenty of opportunities for swimming. 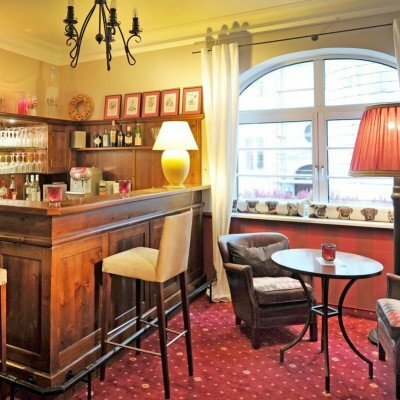 The Leitnerbrau Hotel can be found in the very heart of Mondsee, just a stone's throw from the famous church used in 'The Sound of Music' and a 5-minute stroll from the lakeside where there are frequent summer shows and events. A 30-room, family-run property, it is broad, modern and spacious inside whilst retaining the typical Tyrolean architecture outside. Bedrooms are extremely spacious, with queen size beds and traditional wooden furnishings. The Hotel Post sits on the shores of Attersee, offering panoramic views of Austria's biggest lake as well as a stunning mountain backdrop. 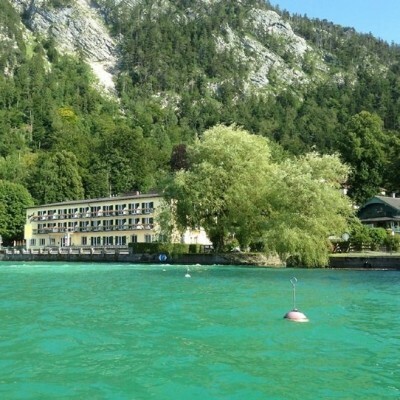 The hotel has its own private beach - so you can swim in what is said to be the warmest waters in the Salzkammergut lake district! 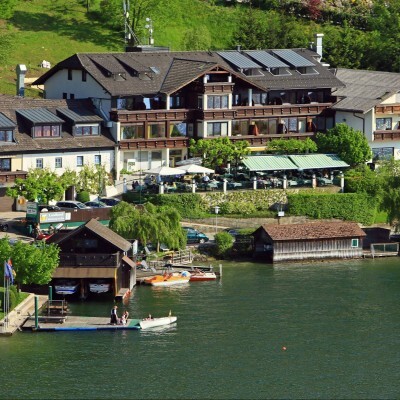 The hotel is decorated in a traditional Austrian style, and most rooms have lake views and balconies. The hotel also benefits from a lakeside sauna. The Hotel Grunberg has a great lakeside location directly below Grunberg Mountain, which soars above the town of Gmunden. The hotel is right on the lakeside, with a view over to the lights of Gmunden itself shimmering on the water. It takes about 10 minutes to cycle into the centre of town. 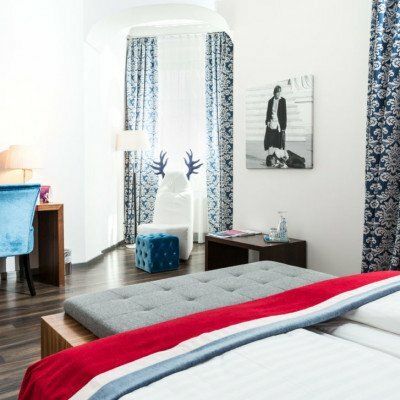 Bedrooms are spacious, and the majority have lake views - they are not typically Austrian, but more contemporary in feel. The Villa Seilern, with its state-of-the-art spa facilities, is available as an upgrade to the Goldenes Schiff. It is a perfect blend of the modern and the traditional, featuring a C19 villa along with a modern and stylish accommodation block. The bedrooms are spacious and use a mixture of natural materials and all have a balcony. The spa facilities at the hotel include an indoor pool, whirlpool, Bio and Finnish sauna and steam bath. Villa Seilern is available at a supplement - please contact us for full details and prices. Transfers included from Salzburg airport at 13:35, and back to Salzburg airport at 11:30. I have used Headwater many times for holidays and always come back to them. This trip was excellent, great hotels, all different with welcoming staff and good food. I thoroughly enjoy the anticipation of cycling onto the next destination, never knowing what we will pass on the way and the sights we will see ( often a delightful surprise). Knowing our luggage will be there at the other end leaving the panniers with the minimum weight inside is liberating. This holiday had smaller mileages than we have had previously but we always used the map to detour off at leisure and explored with the bikes on our days off. The reps Jill and Colin were marvellous, friendly, helpful and knowledgeable coupled with enthusiasm for the area, a winning combination. The briefing was thorough and clear plus additional texts during the week with updates on weather or route. For my husband and I and our 19 and 20 year old sons, this was our first Headwater holiday. Our group consists of 3 reasonably fit casual cyclists and one extremely fit competitive cyclist, nevertheless it was a thoroughly enjoyable experience for all. The routes were superb, mostly on country lanes and cycle paths with a few stretches on the road. Hills were infrequent and in the main doable. The scenery was stunning and the wildlife a pleasure to behold (deer, birds, salamander, butterflies etc) the choice and location of hotels was mainly excellent l, especially at Gmunden, Bad Ischal and Wolfgang. The route allowed you lots of time to organize your own sightseeing and additional cycling. In this regard a visit to the salt mine in Hadshtalt and the train trip from Wolfgang (although a bit pricey) were great fun and are highly recommended. Last but by no means least our Headwater agents in Austria were simply superb in all respects. If the opportunity arises we would be very happy to plan another holiday with Headwater. Every two days from 15th May 2019 to 12th Oct 2019, for 10 nights. All dates are subject to availability, please contact us to check. Due to the tailor-made nature of our holidays, we need a little more information in order for us to check availability for The Sound of Music Cycling. Simply complete the form below and a member of our sales team will contact you (when it's most convenient for you) to provide availability information, travel options and an accurate price. Of course there's no obligation, but if you do wish to proceed with a booking they will be on-hand to assist you throughout the process.